The results of the Marine Corps’ 9-month “Gender Integration” study for the combat arms are barely out and already the Secretary of the Navy declares he’ll ignore them and the Secretary of Defense releases a gag order on discussing women in combat units until he makes his decision on the matter. There’s only a need to stifle debate and hide data: when the facts aren’t in your favor. If the data supported the case for women in combat units, its supporters would be shouting it from the rooftops instead of hiding it from view. Congress needs to pull oversight back with them where it rightly belongs so the people have an honest picture of the costs of sending our active duty females into direct ground combat with ISIS. With speculation about whether the females were passed through Ranger school with special treatment and lowered standards, there’s even more need for investigation and oversight. Steve Russell (R-OK) has asked the Army for proof of standards to include the training records only to be told they were destroyed. The supposed living proof that women are just as combat-capable as infantry men and their records were destroyed? And we’re not supposed to talk about the Marine combat testing showing that male teams outperform coed teams on 69% of tasks and are injured half as much? How very totalitarian. “Until I make the final decision, further public discussion of the [Women in Service Review (WISR)] process is neither helpful or prudent,” said an Oct. 2 memo signed by Carter and obtained by The Hill. “External communication by any official within the Department of Defense regarding specific WISR deliberations and deliberative documents must be coordinated and approved in advance with the Deputy Secretary of Defense,” the memo said. The dictum comes after Congress in the latest NDAA abdicated oversight on the women in combat decision by letting Lorretta Sanchez (D-CA) gut the 30-day notification law by changing it from 30 legislative to 30 calendar days. According to some HASC staffers I spoke to last week, we’re supposed to be glad the notification period wasn’t “vacated” completely per Sanchez’s original amendment. This is typical Washington cartel corruption: Hide the data, kill discussion, remove time for proper legislative oversight. Push it through over the holidays and New Year’s they’re moving females into direct ground combat units preparing to fight ISIS. Congress must have the same opportunity as the SecDef to examine the Marines’ 900 page study in its entirety. The people must be able to get a clear picture of what this administration is getting our women and men into by fully repealing the combat exemption, especially as we face ISIS abroad and, increasingly, at home. The study and participants are being attacked even though they did everything according to the DOD’s required methodology, and wanted to show success. They had buy-in and observation by the Center for Strategic & International Studies, the University of Pittsburgh, Michigan State University and Rand Corp. We can be very proud of the service the Marines provided by hashing out the details of what direct ground combat really requires. The results even showed where standards should be raised for infantry men. Not as eager as the Army to be first in Diversity Metrics, the Marines take combat and the prospect of putting females there very seriously. They have to. When average male Marines outperform top-performing female Marines on nearly 70% of combat tasks, there’s no way one can argue women strengthen combat units. When strong, athletic, female Marines are still injured at more than twice the men’s rate, there’s no way to argue this adds strength. Being a bit smarter and more well-behaved (two amongst the five tasks of 134 where coed teams outperformed the men) can never mitigate for the stack of other negatives from significantly higher rates of injury to the extra (and expensive) accommodations needed, to degraded combat readinees and added risk to all. The study’s findings echo all similar testing from each decade since 1948, every time opening more military jobs and schools to women has come up. The cons far outweigh the pros, they always have and always will because biology is unchanging. The Army denies it, but unfortunately lying and concealing data when it comes to opening combat-related jobs to women is nothing new for the military. In the 1990’s, anxious to prove their diversity and women-friendliness in the post-Tailgate, the Navy and Air Force were competing to be the first to open combat aircraft jobs to women. The Navy gave the same directive to their pilot instructors that the Rangers allegedly got: A woman will pass. And so they did. And then a female pilot, Kara Hultgreen, killed herself when she crashed her plane into the water doing a routine landing maneuver she’d failed at before. Previously touted as proof that women are just as capable combat pilots, the training records revealed that both Hultgreen and the female she went through training with were passed where men would have failed. They were put in positions for which they didn’t qualify and when it resulted in the death of the female pilot, the Navy lied about it and tried to hide the evidence. All so they could show the administration how diverse and not sexist they supposedly were. What if Hultgreen been deployed during the Gulf war? How many lives might she have cost in combat action when the pressure was really on? We have no idea how many more women have been “passed” in this way over the years, but we’re expected to see the female Rangers’ graduation as evidence that women strengthen combat readiness. We’re just supposed to trust Ashton Carter with this and stop talking. Side note: If this what the Army has done with regard to the recently graduated females, what a horrendous thing to do on so many levels. To essentially lie to the American people about these women’s real ability to wage combat with and against men is gross deceit. And what a horrible position to put those women in. It was setting them up for humiliation when the truth inevitably surfaced. What the women did was actually amazing. A positive result of the Marines’ approach by testing the hypothesis that coed teams would perform just as well as all-male teams, the female Marines didn’t fail at anything. They helped us to identify standards that needed adjusting and what the limits are on what top-performing female Marines. This is, like the data on rates of injury, distractions to men and the other discoveries, this information we need. The Rangers on the other hand were set up as proving women are interchangeable with infantry men so that more women can follow. Military women most of all have to be able to rely on a high standard on their training and abilities when positioned at the front. It doesn’t help them or set them up for success in their coveted direct combat jobs – to be pushed through and given something they didn’t earn. It will cost them their lives later, and the lives of sons working with them. It will cost us our ability to fight war on the ground. There will be no extra hand up when your mission is to go kill ISIS in their home turf. Presenting women as having met the same standards when they haven’t is an insult to our intelligence and brutish in its disregard for women’s unique concerns. Passing them on lower standards because the Army’s so anxious to shove through a leftist political policy is absolutely outrageous. It will get more men and women killed, hamper our fighting ability and skyrocket our costs – the human and the financial – for disabilities upon return from war. This is not the SecDef’s decision, and certainly not his to make behind closed doors without discussion. 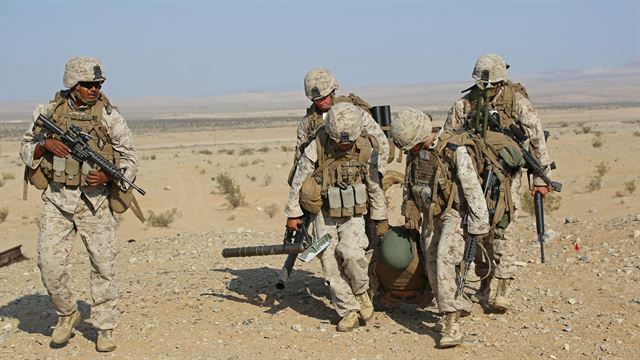 Support the Marines who, in their execution of the integration study remained always faithful to their two top priorities of combat readiness and troop welfare. Their study yielded important data vital to women and the combat arms. Support Seth Moulton’s call to make the results of the study public and grant congress the time they need to conduct oversight. It’s ISIS we’re next sending our sons and daughters to fight in direct ground combat. This is not one man’s decision, this is America’s decision. Kudos to the Marines for conducting an honest study on the effects of sexually integrated infantry units. But common sense tells us that such a study was unnecessary. All one has to do is to look at the sports world where no women compete against men. Would the world’s best female athlete make any college football or NFL team a better team? Would she make any college baseball or major league baseball team a better team? Name any other team sport like rugby, soccer, or basketball. Would the world’s best female athlete make any of these all male teams better? NO! Then how can women make an all male infantry unit a better unit? Pingback: Shut Up, You! SecDef Gags Military on Women In Combat Discussion | Should Women Be In Combat?